1. DO NOT ask your 5 year old boy if he wants to do some canning with Mama. That would be foolish. 2. 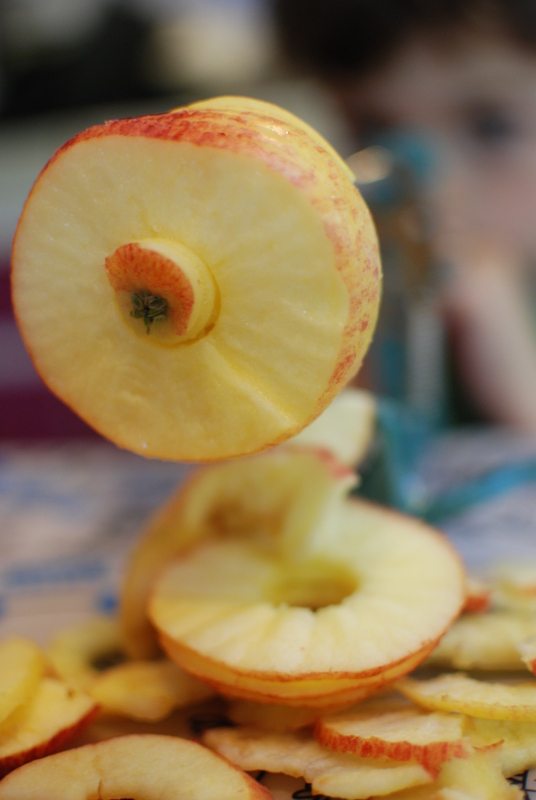 Pull out your Apple Machine as your five year old is busily trussing up the kitchen with Daddy’s climbing ropes like a spider on crack. Resist freaking out about yet another room in the house becoming impassable, move quickly to distraction mode. Loudly comment about how you have really missed your Apple Machine but feel worried about using it, what with all those dangerous blades and that fast spinning handle. Pine for an Apple Machinist to do the job for you. Proceed to pass the first apple through the machine. Betcha 10 bucks that’s the last apple you have to do yourself… for at least 10 minutes. The Apple Machinist in action. 3. 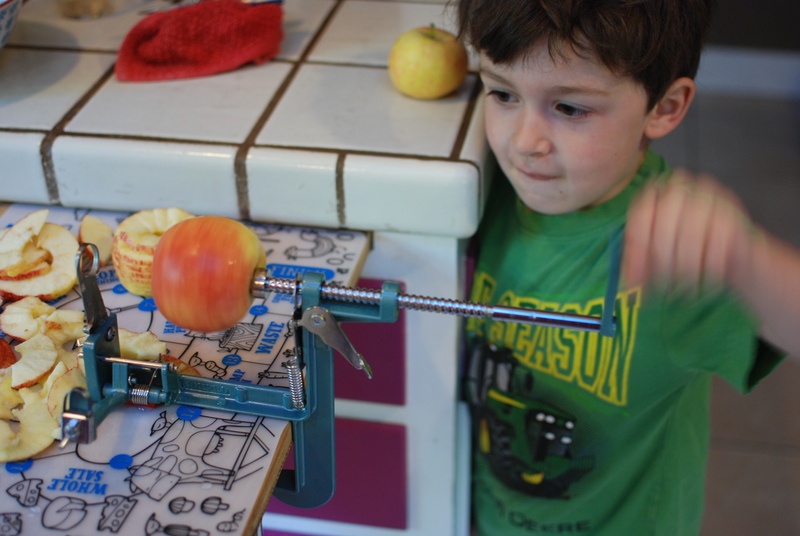 Pacify the future Machinist with apple scraps. 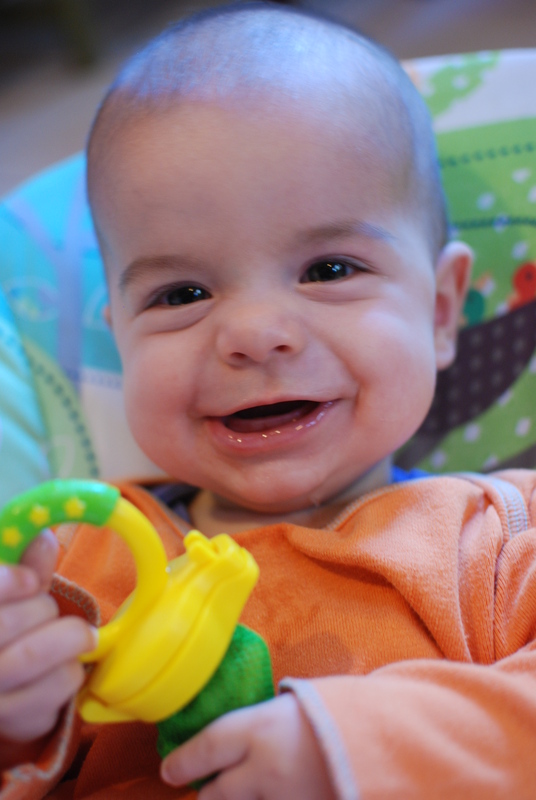 This is the expression your baby will make during approximately 5 seconds of the canning process. If you’re lucky. 4. Once the allure of blades and speed has worn off, move on to packing the apples in your Vitamix for some very LOUD blending. It must be on HIGH power and you must jump each time your 5 year old hits the start button to show how terrifyingly powerful the Vitamix truly is. 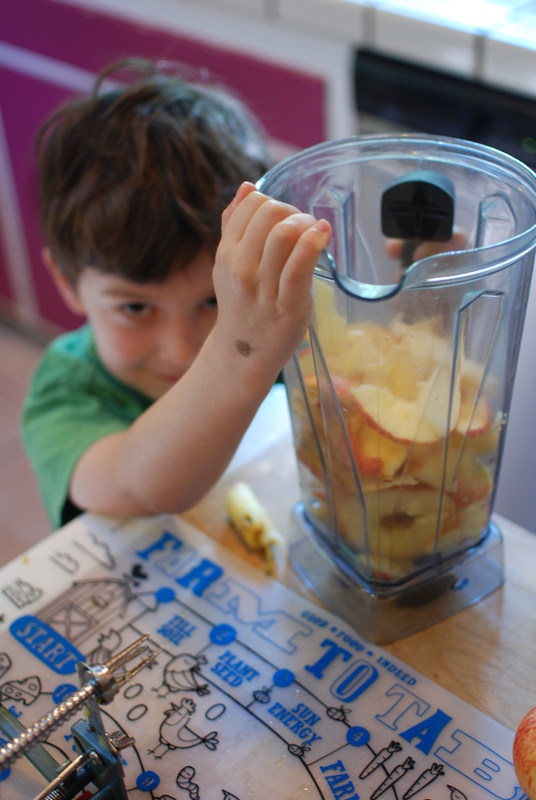 Have your 5 year old vigorously plunge the apples with the Vitamix plunger doodad until all is smooth. Include the peels! This is a Vitamix, after all. 5. Cook up the sauce and can as per usual. Pat self on back for engaging child in such a wholesome activity. Realize half the apple you gave the baby is somehow covering that portion of your back. Wistfully wish you could shower the mush from your hair. Settle for wiping self down with the sock that is so conveniently lying on the kitchen floor. 6. No more steps! Collapse in a heap next to the dog on the floor and hope someone else makes dinner. This entry was posted in Kitchen, O, Urban Homesteading and tagged canning, cooking, parenting, urban homesteading on September 13, 2013 by fullheartsfarm. Okay, you’ve done it again. I just welled up in tears! Can you believe it?? Applesauce. Aw man, that’s the best! I sure never can guess. Beautifully written and photographed! Where can I get applesauce for lunch? It sounds delicious. Come on by the homestead! While I don’t like applesauce, I love this post! I’m looking forward to your future posts. Thank you, and happy Friday! Soon you’ll be in applesauce smearing range yourself. We can’t wait! Haha!! This was awesome. Had a great laugh!! Tips have been noted and will be applied at next attempt. That sounds about right. We have our nine year old make our ranch dressing now. He has become a food snob. Last time he made it he told me he preferred to use fresh herbs in his dressing because it is much more flavorful. Who am I to argue? Never thought about the vitamix for applesauce, definitely doing that next time. Amen to fresh herbs! That’s so cute. The Vitamix is my canning secret weapon. We make our tomato sauce for canning with it too- just quarter them, throw them in and cook down as much as you want. Yes, this week is NUTS. Next week, though!